Gemini's objective was the development of space travel techniques to support the Apollo mission to land astronauts on the Moon. It performed missions long enough for a trip to the Moon and back, perfected working outside the spacecraft with extra-vehicular activity (EVA), and pioneered the orbital maneuvers necessary to achieve space rendezvous and docking. With these new techniques proven by Gemini, Apollo could pursue its prime mission without doing these fundamental exploratory operations. The astronaut corps that supported Project Gemini included the "Mercury Seven", "The New Nine", and the 1963 astronaut class. During the program, three astronauts died in air crashes during training, including both members of the prime crew for Gemini 9. This mission was flown by the backup crew, the only time a backup crew has completely replaced a prime crew on a mission in NASA's history to date. Gemini was robust enough that the United States Air Force planned to use it for the Manned Orbital Laboratory (MOL) program, which was later canceled. Gemini's chief designer, Jim Chamberlin, also made detailed plans for cislunar and lunar landing missions in late 1961. He believed that Gemini spacecraft could fly in lunar operations before Project Apollo, and cost less. NASA's administration did not approve those plans. In 1969, McDonnell-Douglas proposed a "Big Gemini" that could have been used to shuttle up to 12 astronauts to the planned space stations in the Apollo Applications Project (AAP). The only AAP project funded was Skylab – which used existing spacecraft and hardware – thereby eliminating the need for Big Gemini. The constellation for which the project was named is commonly pronounced /ˈdʒɛmɪnaɪ/, the last syllable rhyming with eye. However, staff of the Manned Spacecraft Center, including the astronauts, tended to pronounce the name /ˈdʒɛmɪni/, rhyming with knee. NASA's public affairs office issued a statement in 1965 declaring "Jeh-mih-nee" to be the "official" pronunciation. Gus Grissom, acting as Houston capsule communicator when Ed White performed his spacewalk on Gemini 4, is heard on flight recordings pronouncing the spacecraft's call sign "Jeh-mih-nee 4", and the NASA pronunciation is used in the movie First Man. The Apollo program was conceived in early 1960 as a three-man spacecraft to follow Project Mercury. Jim Chamberlin, the head of engineering at the Space Task Group (STG), was assigned in February 1961 to start working on a bridge program between Mercury and Apollo. He presented two initial versions of a two-man spacecraft, then designated Mercury Mark II, at a NASA retreat at Wallops Island in March 1961. Scale models were shown in July 1961 at the McDonnell Aircraft Corporation's offices in St. Louis. Canadian engineer Jim Chamberlin designed the Gemini capsule, which carried a crew of two. He was previously the chief aerodynamicist on Avro Canada's Avro Arrow fighter interceptor program. Chamberlin joined NASA along with 25 senior Avro engineers after cancellation of the Arrow program, and became head of the U.S. Space Task Group's engineering division in charge of Gemini. The prime contractor was McDonnell Aircraft Corporation, which was also the prime contractor for the Project Mercury capsule. Astronaut Gus Grissom was heavily involved in the development and design of the Gemini spacecraft. What other Mercury astronauts dubbed "Gusmobile" was so designed around Grissom's 5'6" body that, when NASA discovered in 1963 that 14 of 16 astronauts would not fit in the spacecraft, the interior had to be redesigned. Grissom wrote in his posthumous 1968 book Gemini! that the realization of Project Mercury's end and the unlikelihood of his having another flight in that program prompted him to focus all of his efforts on the upcoming Gemini program. 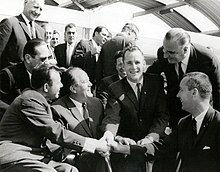 The Gemini program was managed by the Manned Spacecraft Center, located in Houston, Texas, under direction of the Office of Manned Space Flight, NASA Headquarters, Washington, D.C. Dr. George E. Mueller, Associate Administrator of NASA for Manned Space Flight, served as acting director of the Gemini program. William C. Schneider, Deputy Director of Manned Space Flight for Mission Operations, served as mission director on all Gemini flights beginning with Gemini 6A. Guenter Wendt was a McDonnell engineer who supervised launch preparations for both the Mercury and Gemini programs and would go on to do the same when the Apollo program launched crews. His team was responsible for completion of the complex pad close-out procedures just prior to spacecraft launch, and he was the last person the astronauts would see prior to closing the hatch. The astronauts appreciated his taking absolute authority over, and responsibility for, the condition of the spacecraft and developed a good-humored rapport with him. NASA selected McDonnell Aircraft, which had been the prime contractor for the Project Mercury capsule, in 1961 to build the Gemini capsule, the first of which was delivered in 1963. The spacecraft was 18 feet 5 inches (5.61 m) long and 10 feet (3.0 m) wide, with a launch weight varying from 7,100 to 8,350 pounds (3,220 to 3,790 kg). 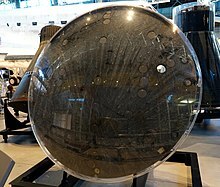 The Gemini crew capsule (referred to as the Reentry Module) was essentially an enlarged version of the Mercury capsule. Unlike Mercury, the retrorockets, electrical power, propulsion systems, oxygen, and water were located in a detachable Adapter Module behind the Reentry Module. A major design improvement in Gemini was to locate all internal spacecraft systems in modular components, which could be independently tested and replaced when necessary, without removing or disturbing other already tested components. Many components in the capsule itself were reachable through their own small access doors. Unlike Mercury, Gemini used completely solid-state electronics, and its modular design made it easy to repair. Gemini's emergency launch escape system did not use an escape tower powered by a solid-fuel rocket, but instead used aircraft-style ejection seats. The tower was heavy and complicated, and NASA engineers reasoned that they could do away with it as the Titan II's hypergolic propellants would burn immediately on contact. A Titan II booster explosion had a smaller blast effect and flame than on the cryogenically fueled Atlas and Saturn. Ejection seats were sufficient to separate the astronauts from a malfunctioning launch vehicle. At higher altitudes, where the ejection seats could not be used, the astronauts would return inside the spacecraft, which would separate from the launch vehicle. The main proponent of using ejection seats was James Chamberlin, head of the engineering division of NASA's Space Force Task Group. Chamberlin had never liked the Mercury escape tower and wished to use a simpler alternative that would also reduce weight. He reviewed several films of Atlas and Titan II ICBM failures, which he used to estimate the approximate size of a fireball produced by an exploding launch vehicle and from this he gauged that the Titan II would produce a much smaller explosion, thus the spacecraft could get away with ejection seats. Maxime Faget, the designer of the Mercury LES, was on the other hand less-than-enthusiastic about this setup. Aside from the possibility of the ejection seats seriously injuring the astronauts, they would also only be usable for about 40 seconds after liftoff, by which point the booster would be attaining Mach 1 speed and ejection would no longer be possible. He was also concerned about the astronauts being launched through the Titan's exhaust plume if they ejected in-flight and later added that "The best thing about Gemini was that they never had to make an escape." Gemini was the first astronaut-carrying spacecraft to include an onboard computer, the Gemini Guidance Computer, to facilitate management and control of mission maneuvers. This computer, sometimes called the Gemini Spacecraft On-Board Computer (OBC), was very similar to the Saturn Launch Vehicle Digital Computer. The Gemini Guidance Computer weighed 58.98 pounds (26.75 kg). Its core memory had 4096 addresses, each containing a 39-bit word composed of three 13-bit "syllables". All numeric data was 26-bit two's-complement integers (sometimes used as fixed-point numbers), either stored in the first two syllables of a word or in the accumulator. Instructions (always with a 4-bit opcode and 9 bits of operand) could go in any syllable. 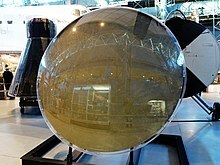 Unlike Mercury, Gemini used in-flight radar and an artificial horizon, similar to those used in the aviation industry. Astronauts had no control over Mercury's flight path, and computers flew most of Apollo missions. Gemini crew had full manual control with control sticks for yaw, pitch, and roll and forward or backward. The original intention for Gemini was to land on solid ground instead of at sea, using a Rogallo wing rather than a parachute, with the crew seated upright controlling the forward motion of the craft. To facilitate this, the airfoil did not attach just to the nose of the craft, but to an additional attachment point for balance near the heat shield. This cord was covered by a strip of metal which ran between the twin hatches. This design was ultimately dropped, and parachutes were used to make a sea landing as in Mercury. The capsule was suspended at an angle closer to horizontal, so that a side of the heat shield contacted the water first. This eliminated the need for the landing bag cushion used in the Mercury capsule. The adapter module in turn was separated into a Retro module and an Equipment module. The Retro module contained four solid-fuel TE-M-385 Star-13E retrorockets, each spherical in shape except for its rocket nozzle, which were structurally attached to two beams that reached across the diameter of the retro module, crossing at right angles in the center. Re-entry began with the retrorockets firing one at a time. Abort procedures at certain periods during lift-off would cause them to fire at the same time, thrusting the Descent module away from the Titan rocket. Gemini was equipped with an Orbit Attitude and Maneuvering System (OAMS), containing sixteen thrusters for translation control in all three perpendicular axes (forward/backward, left/right, up/down), in addition to attitude control (pitch, yaw, and roll angle orientation) as in Mercury. Translation control allowed changing orbital inclination and altitude, necessary to perform space rendezvous with other craft, and docking with the Agena Target Vehicle (ATV), with its own rocket engine which could be used to perform greater orbit changes. Gemini was in some regards more advanced than Apollo because the latter program began almost a year earlier. It became known as a "pilot's spacecraft" due to its assortment of jet fighter-like features, in no small part due to Gus Grissom's influence over the design, and it was at this point where the American manned space program clearly began showing its superiority over that of the Soviet Union with long duration flight, rendezvous, and extravehicular capability. [Note 4] The Soviet Union during this period was developing the Soyuz spacecraft intended to take cosmonauts to the Moon, but political and technical problems began to get in the way, leading to the ultimate end of their manned lunar program. The Titan II had debuted in 1962 as the Air Force's second-generation ICBM to replace the Atlas. By using hypergolic fuels, it could be stored for long periods of time and be easily readied for launch in addition to being a simpler design with fewer components, the only caveat being that the propellant mix (nitrogen tetroxide and hydrazine) was extremely toxic compared to the Atlas's liquid oxygen/RP-1. However, the Titan had considerable difficulty being man-rated due to early problems with pogo oscillation. The launch vehicle used a radio guidance system that was unique to launches from Cape Kennedy. In late 1963, Slayton selected Shepard and Stafford for Gemini 3, McDivitt and White for Gemini 4, and Schirra and Young for Gemini 5 (which was to be the first Agena rendezvous mission). The backup crew for Gemini 3 was Grissom and Borman, who were also slated for Gemini 6, to be the first long-duration mission. Finally Conrad and Lovell were assigned as the backup crew for Gemini 4. Delays in the production of the Agena Target Vehicle caused the first rearrangement of the crew rotation. The Schirra and Young mission was bumped to Gemini 6 and they became the backup crew for Shepard and Stafford. Grissom and Borman then had their long-duration mission assigned to Gemini 5. The second rearrangement occurred when Shepard developed Ménière's disease, an inner ear problem. 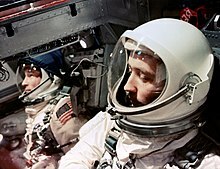 Grissom was then moved to command Gemini 3. Slayton felt that Young was a better personality match with Grissom and switched Stafford and Young. Finally, Slayton tapped Cooper to command the long-duration Gemini 5. Again for reasons of compatibility, he moved Conrad from backup commander of Gemini 4 to pilot of Gemini 5, and Borman to backup command of Gemini 4. Finally he assigned Armstrong and Elliot See to be the backup crew for Gemini 5. The third rearrangement of crew assignment occurred when Slayton felt that See wasn't up to the physical demands of EVA on Gemini 8. He reassigned See to be the prime commander of Gemini 9 and put Scott as pilot of Gemini 8 and Charles Bassett as the pilot of Gemini 9. The fourth and final rearrangement of the Gemini crew assignment occurred after the deaths of See and Bassett when their trainer jet crashed, coincidentally into a McDonnell building which held their Gemini 9 capsule in St. Louis. The backup crew of Stafford and Cernan was then moved up to the new prime crew of the re-designated Gemini 9A. Lovell and Aldrin were moved from being the backup crew of Gemini 10 to be the backup crew of Gemini 9. This cleared the way through the crew rotation for Lovell and Aldrin to become the prime crew of Gemini 12. On Gemini 4, Ed White became the first American to make an extravehicular activity (EVA, or "space walk") on June 3, 1965. Gemini 5 (August 21-29, 1965) demonstrated the 8-day endurance necessary for an Apollo lunar mission with the first use of fuel cells to generate its electrical power. Gemini 6A and 7 accomplished the first space rendezvous in December 1965, and Gemini 7 set a 14-day endurance record. 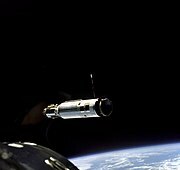 Gemini 8 achieved the first space docking with an unmanned Agena Target Vehicle. Gemini 10 established that radiation at high altitude was not a problem, further demonstrated the ability to rendezvous with a passive object, and would also be the first Gemini mission to fire the Agena's own rocket. Mike Collins would be the first person to meet another spacecraft in orbit, during his second successful EVA. Gemini 11 set a manned Earth orbital altitude record of 739.2 nautical miles (1,369.0 km) in September 1966, using the Agena target vehicle's propulsion system. This record still stands as of 2017. On Gemini 12 Edwin "Buzz" Aldrin became the first space traveller to prove that useful work could be done outside a spacecraft without life-threatening exhaustion, due to newly implemented footholds, handholds and scheduled rest periods. Rendezvous in orbit is not a straightforward maneuver. Should a spacecraft increase its speed to catch up with another, the result is that it goes into a higher and slower orbit and the distance thereby increases. The right procedure is to go to a lower orbit first and which increases relative speed, and then approach the target spacecraft from below and decrease orbital speed to meet it. To practice these maneuvers special rendezvous and docking simulators were built for the astronauts. 1: The mission duration was 4h 50m, sufficient to achieve all of the mission aims in three orbits; the spacecraft remained in orbit for 3d 23h. 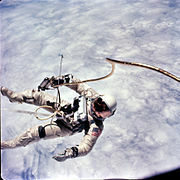 Included first extravehicular activity (EVA) by an American; White's "space walk" was a 22-minute EVA exercise. First week-long flight; first use of fuel cells for electrical power; evaluated guidance and navigation system for future rendezvous missions. Completed 120 orbits. 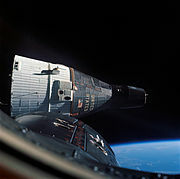 When the original Gemini VI mission was scrubbed because the launch of the Agena docking target failed, Gemini VII was used as the rendezvous target instead. Primary objective was to determine whether humans could live in space for 14 days. First space rendezvous accomplished with Gemini VII, station-keeping for over five hours at distances from 1 to 300 feet (0.30 to 91 m). Rescheduled from May to rendezvous and dock with the Augmented Target Docking Adapter (ATDA) after the original Agena Target Vehicle launch failed. The ATDA shroud did not completely separate, making docking impossible. Three different types of rendezvous, two hours of EVA, and 44 orbits were completed. First use of the Agena Target Vehicle's propulsion systems. The spacecraft also rendezvoused with the Agena Target Vehicle from Gemini VIII. Collins had 49 minutes of EVA standing in the hatch and 39 minutes of EVA to retrieve experiments from the Agena. 43 orbits completed. Gemini record altitude with apogee of 739.2 nautical miles (1,369.0 km) reached using the Agena Target Vehicle propulsion system after first orbit rendezvous and docking. Gordon made a 33-minute EVA and two-hour standup EVA. 44 orbits. The Gemini-Titan II launch vehicle was adapted by NASA from the U.S. Air Force Titan II ICBM. (Similarly, the Mercury-Atlas launch vehicle had been adapted from the USAF Atlas missile.) The Gemini-Titan II rockets were assigned Air Force serial numbers, which were painted in four places on each Titan II (on opposite sides on each of the first and second stages). USAF crews maintained Launch Complex 19 and prepared and launched all of the Gemini-Titan II launch vehicles. Data and experience operating the Titans was of value to both the U.S. Air Force and NASA. The USAF serial numbers assigned to the Gemini-Titan launch vehicles are given in the tables above. Fifteen Titan IIs were ordered in 1962 so the serial is "62-12XXX", but only "12XXX" is painted on the Titan II. The order for the last three of the 15 launch vehicles was canceled on July 30, 1964, and they were never built. Serial numbers were, however, assigned to them prospectively: 12568 - GLV-13; 12569 - GLV-14; and 12570 - GLV-15. From 1962 to 1967, Gemini cost $1.3 billion in 1967 dollars ($7.62 billion in 2018). In January 1969, a NASA report to the US Congress estimating the costs for Mercury, Gemini, and Apollo (through the first manned Moon landing) included $1.2834 billion for Gemini: $797.4 million for spacecraft, $409.8 million for launch vehicles, and $76.2 million for support. Gemini IV: National Air and Space Museum, Washington, D.C.
Gemini 3A —St. Louis Science Center, St. Louis, Missouri. McDonnell Aircraft, the main contractor for Mercury and Gemini, was also one of the original bidders on the prime contract for Apollo, but lost out to North American Aviation. McDonnell later sought to extend the Gemini program by proposing a derivative which could be used to fly a cislunar mission and even achieve a manned lunar landing earlier and at less cost than Apollo, but these proposals were rejected by NASA. A range of applications were considered for Advanced Gemini missions, including military flights, space station crew and logistics delivery, and lunar flights. The Lunar proposals ranged from reusing the docking systems developed for the Agena Target Vehicle on more powerful upper stages such as the Centaur, which could propel the spacecraft to the Moon, to complete modifications of the Gemini to enable it to land on the lunar surface. Its applications would have ranged from manned lunar flybys before Apollo was ready, to providing emergency shelters or rescue for stranded Apollo crews, or even replacing the Apollo program. Some of the Advanced Gemini proposals used "off-the-shelf" Gemini spacecraft, unmodified from the original program, while others featured modifications to allow the spacecraft to carry more crew, dock with space stations, visit the Moon, and perform other mission objectives. Other modifications considered included the addition of wings or a parasail to the spacecraft, in order to enable it to make a horizontal landing. Big Gemini (or "Big G") was another proposal by McDonnell Douglas made in August 1969. It was intended to provide large-capacity, all-purpose access to space, including missions that ultimately used Apollo or the Space Shuttle. The study was performed to generate a preliminary definition of a logistic spacecraft derived from Gemini that would be used to resupply an orbiting space station. Land-landing at a preselected site and refurbishment and reuse were design requirements. 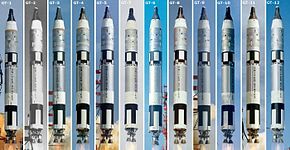 Two baseline spacecraft were defined: a nine-man minimum modification version of the Gemini B called Min-Mod Big G and a 12-man advanced concept, having the same exterior geometry but with new, state-of-the-art subsystems, called Advanced Big G. Three launch vehicles-Saturn IB, Titan IIIM, and Saturn INT-20 (S-IC/S-IVB) were investigated for use with the spacecraft. 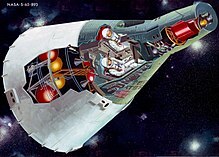 The Air Force had an interest in the Gemini system, and decided to use its own modification of the spacecraft as the crew vehicle for the Manned Orbital Laboratory. To this end, the Gemini 2 spacecraft was refurbished and flown again atop a mockup of the MOL, sent into space by a Titan IIIC. This was the first time a spacecraft went into space twice. The USAF also had the notion of adapting the Gemini spacecraft for military applications, such as crude observation of the ground (no specialized reconnaissance camera could be carried) and practicing making rendezvous with suspicious satellites. This project was called Blue Gemini. The USAF did not like the fact that Gemini would have to be recovered by the US Navy, so they intended for Blue Gemini eventually to use the airfoil and land on three skids, carried over from the original design of Gemini. At first some within NASA welcomed sharing of the cost with the USAF, but it was later agreed that NASA was better off operating Gemini by itself. Blue Gemini was canceled in 1963 by Secretary of Defense Robert McNamara, who decided that the NASA Gemini flights could conduct necessary military experiments. MOL was canceled by Secretary of Defense Melvin Laird in 1969, when it was determined that unmanned spy satellites could perform the same functions much more cost-effectively. Two Gemini capsules (codenamed "Jupiter" instead of "Gemini") are featured in the plot of the 1967 James Bond film You Only Live Twice. A modified one-man Gemini capsule is used to send an astronaut (played by James Caan) to the Moon in the 1968 film Countdown. 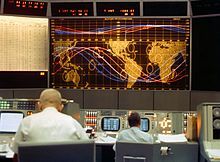 ^ Gemini 3 used the Mercury Control Center located at Cape Kennedy for flight control, as the new center was still in a test status. Gemini 4 was the first to be guided from Houston, with Mercury Control as a backup. From Gemini 5 through today, all flights are controlled from Houston. ^ The requirement for a touchdown on land using a paraglider was canceled in 1964. ^ During the ten manned flights of the Gemini program, the Soviets made no manned flights, and despite achieving the first EVA, did no more EVAs until January 1969. ^ Armstrong retired from the US Navy in 1960. ^ a b Lafleur, Claude (2010-03-08). "Costs of US piloted programs". The Space Review. Retrieved February 18, 2012. ^ a b Schwartz, John (October 17, 2018). "Why Does 'First Man' Say Gemini as 'Geminee'? NASA Explains. Sorta". The New York Times. Retrieved November 6, 2018. ^ Hacker & Grimwood (1977), pp. XV, 75. ^ Hacker & Grimwood (1977), p. 75. ^ a b Agle (1998). ^ Dryden (1964), p. 362. ^ Dryden (1965), p. 364. ^ Glen E. Swanson, ed., "Before This Decade Is Out: Personal Reflections on the Apollo Program," Dover Publications 2012, p. 354. ^ Betancourt, Mark (October–November 2018). "Abort!". Air & Space/Smithsonian. Vol. 33 no. 5. p. 39. Retrieved March 16, 2019. ^ Vantine, William (October 15, 1997). "Thomas P. Stafford Oral History". Johnson Space Center Oral History Project. NASA. Retrieved March 16, 2019. ^ a b Tomayko (1988), pp. 10–19. ^ "IBM Archives: IBM and the Gemini Program". 23 January 2003. ^ "Losing Rogallo from Gemini". Vintage Space. Amy Shira Teitel. 2011-05-22. Retrieved 2012-12-23. ^ Buzz Aldrin (Fall 2005). "Orbital Rendezvous". Buzz Aldrin's Share Space Foundation. Retrieved 2011-10-09. French, Francis; Brugess, Colin (2007). In the Shadow of the Moon: A Challenging Journey to Tranquility, 1965–1969. Lincoln, Nebraska: University of Nebraska. ISBN 978-0-8032-1128-5. Agle, D.C. (September 1998). "Flying the Gusmobile". Air and Space Magazine. Washington, DC: Smithsonian Institution. 12 (4). Retrieved 2015-01-03. Agle, D.C. (September 1998a). "Riding the Titan II". Air and Space Magazine. Washington, DC: Smithsonian Institution. 12 (4). Retrieved 2015-01-03. Burkey, Ronald (2012-01-08). "Gemini Spacecraft On-Board Computer (OBC)". Archived from the original on 2015-01-05. Retrieved 2015-01-04. 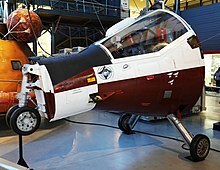 Wikimedia Commons has media related to Project Gemini. This page was last edited on 11 April 2019, at 13:24 (UTC).